Elite: Dangerous, the great big expansive space sim has one notable advantage over Star Citizen: It’s actually out, playable for people who love the idea of flying through space right now. And soon, it’ll even have planetary landings, which comes as the first part of the newly announced Horizons season on expansion content. Yes, you’ll soon be able to land on planets, and pilot a surface vehicle as you look for stuff on these new worlds. “We’re beginning with airless, rocky worlds – places where a great deal of new gameplay can take place. These are planet-sized sandbox environments, with all sorts of things to discover hidden on them. You’ll find surface starports, crashed ships, mineral deposits, hidden bases and more. It goes up for pre-order today. Here’s a trailer. Elite Dangerous: Horizons launches this Holiday. The first expansion, Planetary Landings introduces players to planet surfaces and the first all-new Surface Recon Vehicle (SRV) the ‘Scarab’. Scanning airless planets and moons brings new gameplay as players detect signals, crashed ships, mineral deposits, outposts and fortresses. Alone or with friends players will explore, mine and engage hostile forces as they attempt to infiltrate strongholds guarding valuable rewards. Players will explore new worlds, coasting over mountaintops, diving into canyons, landing on the surface and rolling out onto the surface in your SRV, all without loading times or breaks in gameplay. 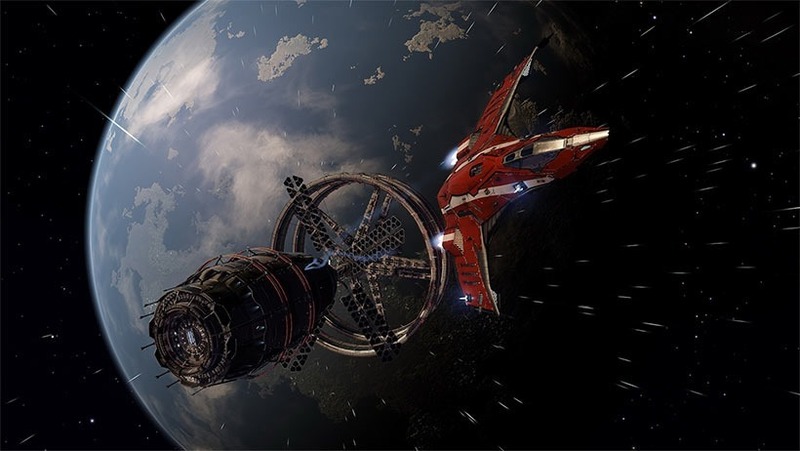 Elite Dangerous: Horizons will continue to introduce new features and gameplay as the season continues into 2016, enriching the Elite Dangerous experience with new activities and new ways to play. Elite Dangerous: Horizons includes all Elite Dangerous content to date, and all players will continue to fly together in the same galaxy. Existing Elite Dangerous players receive a £10 loyalty discount off the price of Elite Dangerous: Horizons, retaining their progress and unlocking the exclusive ‘Cobra Mk IV’ in-game spacecraft. Previous article Am I reading too much into the Gamescom 2015 Metal Gear Solid V trailer? Next article Is Destiny finally headed to PC?